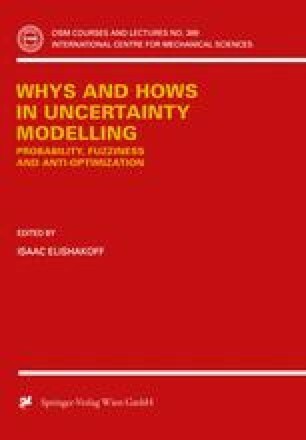 What are the Random and Fuzzy Sets and How to Use Them for Uncertainty Modelling in Engineering Systems? Probabilistic and set-based models of the uncertainty are combined reviewing the idea of random set. Moreover fuzzy sets are defined as a particular case, i.e. consonant random sets. Inclusion and extension, through a deterministic function, of random sets or relations give powerful methods to evaluate probabilistic bounds of the response of deterministic systems with uncertain parameters or uncertain input variables. Combination of independently given information about the same system is discussed both in the ambit of set-based and probability-based model of uncertainty. The limits entailed by the proposed solutions are highlighted together with their overcoming suggested by evidence theory and fuzzy logic. Random set theory suggests robust and simple procedures to take into account the uncertainties of the involved variables and parameters in the field of structural engineering, and more generally in civil and mechanical engineering. Numerical applications to reliability evaluations and structural mono-objective optimisation are presented to demonstrate their usefulness. Lastly the applications of fuzzy logic to decision making, pattern recognition, fuzzy controller, fuzzy expert systems, multi-objective optimisation are briefly discussed. The procedures are clarified through some simple numerical examples.